I also mentioned how I’d sold everything at the bottom of the bear market in 2003 and, with hindsight, I think that blunder deserves to be highlighted with a lesson of its own. Between 1995 (when I started investing) and 2000 (at the peak of the dot-com bubble) I had built up a retirement pot of about £20k and every penny of it was held in a FTSE All-Share tracker. In 2003, after seeing the value of my pension pot decline by around 50%, I sold the lot and switched to the safety of cash. Of course the market then turned around and gained 40% over the following year or two, which I completely missed out on. My big mistake was to look purely at the price decline whilst paying no attention to what I was actually invested in. 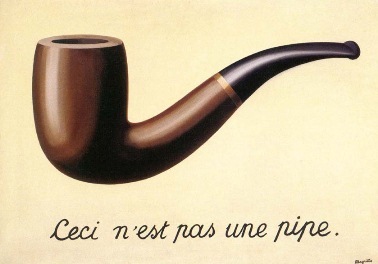 Much like the famous painting which declares “this is not a pipe”, the price of the FTSE All-Share is not the FTSE All-Share. The FTSE All-Share is a collection of several hundred publicly-listed companies, weighted towards large companies that generate hundreds of millions of pounds in revenues and profits every year. The price of the FTSE All-Share is simply the price that other investors are willing to buy or sell a share of those companies for. Looking at this idea from a different angle, if I’d invested in a buy-to-let property, with no mortgage, and had a happy tenant paying me a reliable rent which I put up by 5% every year, would it really matter if the market price of that house fell by 50%? It might matter a lot if I had to sell the house in the near future, so price movements do matter to those who are looking to cash in their investments. But what if I was looking to hold that property and receive a growing income (an inevitable capital gains) over the next ten or 20 years? Why should I care if the price falls this year by 50%? Okay, if the price falls by 50% because the roof falls in then fair enough. The roof falling in would either need additional funds to repair, or it would massively reduce the rental income. But if the house is fine, the tenant is happy and the future looks little changed than before, why should I care about a 50% price decline? My opinion is that I shouldn’t care about falling prices if the underlying asset is unchanged. 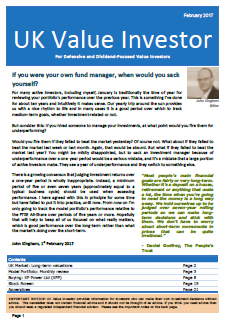 This buy-to-let scenario is a good analogy for the stock market and how long-term investors should view price movements. In 2003 the FTSE All-Share’s dividend was little changed from the year before, or the year before that. It would, in future, continue to pay a dividend which usually grow slightly faster than inflation. 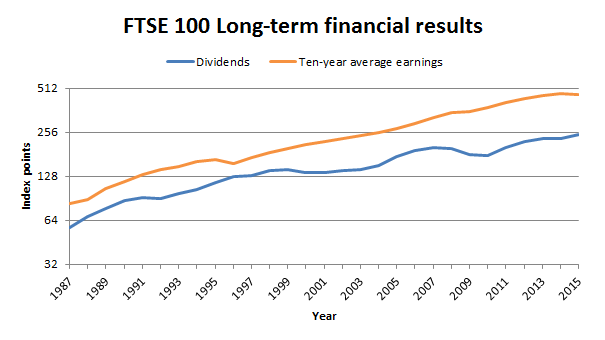 The chart below shows how defensive and progressive the dividends and ten-year average earnings of the FTSE 100 have been for almost 30 years (the FTSE 100 is more or less the same as the All-Share for the purpose of this discussion). The income generating potential of the underlying asset (i.e. those large listed companies) changed very little between 2000 and 2003, and so as a long-term investor the index’s price decline should have been more or less irrelevant. In fact, the lower valuation and higher dividend yield should have enticed me to save and invest even more, rather than leaving the stock market and moving into cash. And that was my next big lesson. In 2004 I sat on the side-lines and watched the market shoot upwards once again. Dazed and confused, I started researching the stock market in order to understand where I’d gone wrong. However, while I was proving to be a particularly useless stock market investor, my “investment” in property – i.e. the home I’d bought in 1996 – was doing almost ridiculously well. Between 1996 and 2000 it doubled in price. Then, between 2000 and 2004 it doubled in price again. If that isn’t ridiculous then I don’t know what is. After some additional research I felt that the housing market had little room for further PE ratio expansion, so I decided to up sticks and sell in 2004 to lock in those capital gains. After a brief splurge (a few holidays, a Jaguar XK8) I reinvested what was left into the stock market, which I felt was much more attractively priced than the UK housing market. Buy rock solid assets at low prices (which typically means when everyone else thinks they’re a bad investment), wait a while and then, with a bit of luck, sell when other investors jump on the bandwagon. Of course finding a rock solid investment which is available at a low price is the hard bit. In truth it took me until 2007 before I found an approach (deep value investing) that I was happy with. And even then there were many bumps in the road, especially through the financial crisis. 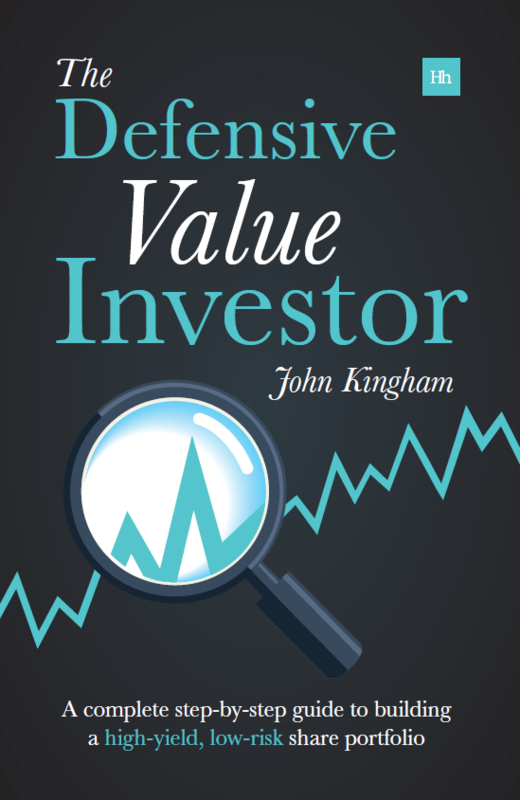 In 2010 I’d had enough of deep value investing and switched to defensive value investing, and have been refining that approach ever since. And that, I think, is the last big lesson that I have learned. Having spent 13 years as a software engineer I cannot help but think in terms of definable, repeatable processes. Investing, in my opinion, should involve the methodical application of a well-designed process. Pilots and surgeons don’t (or shouldn’t) make it up as they go along. Every predictable, repeatable action (whether landing a 747 or removing a patient’s leg) should have a defined process and an optimal way of doing things. In many cases these are written down as checklists that are used in real-time (as explained exquisitely in The Checklist Manifesto). Investors should follow the example of pilots and surgeons and have a written plan which they can apply diligently, over and over again. More importantly, the process should be improved – incrementally and carefully – at every opportunity, taking care to avoid changes that are too large, too frequent or poorly thought through. When you’re investing, try to have the mindset of an airline pilot or brain surgeon, with the lives of many people in your hands. You may find that you raise your game and apply a higher level of professionalism to your investment decisions, and that is surely something your portfolio and its beneficiaries deserve. Have you ever considered using leverage? Gearing works well for buy to let investors over the long term. As I remember stocks average (without reinvesting dividends) about 8% a year and buy to let without a mortgage is about 2-5%, assuming rents are not reinvested. However borrowing puts BTL ahead at about 12% since you get an extra £4 for every one you put down. Nobody seems to have considered margin in this analysis though, which would favour stocks. Hi Andrew, the property mentioned in the post was my home, with the usual (for the time) 5% deposit and 95% mortgage, so it was levered up to the eyeballs as most first-time homes are. As for BTL, I have looked at it a few times but I don’t think it’s for me, especially given the recent changes to stamp duty, tax allowances and other things. Plus I like the stock market and have a fair amount of experience in it now so I’m happy to stick with stocks. BTL will always produce higher returns than stocks as it is typically levered up, but of course the risks are massively higher too as you can lose huge multiples of the original investment. It’s horses for courses as they say. Agree with you on the hassle factor of buy to let and I too prefer stocks, but I would like to point out that actually the volatility is much greater with stocks than property. Once property is leveraged up they are about the same. The plot for the S&P 500 vs US real estate is appended below. I have seen the UK plots but couldn’t track them down for this comment. True, but price volatility isn’t really a factor in most BTLers thinking, at least of those that I know. They’re just waiting 10/20/30 years until they’re ready to retire and then they’ll sell up, pay off the mortgage and pocket the equity (minus capital gains tax of course). Stock market investors could buy on margin and do the same thing, but I think seeing their portfolio valued every day and the ease of selling is too tempting. It’s this that forces most people out of the market at the wrong time. Its much harder for the BTL investor, he walks around assuming his property is worth more than it is and even if he knew the value and wanted to panic sell he probably couldn’t. Great post. I like the way that you plot out your course of learning from the years of investing in the market and deduce it to a more methodical approach; probably due to your background. So I will stick with investing in shares/funds as it involves some time & effort, but no leverage and ride out the market by taking the natural dividend as and when I want to without the worry of maintaining the physical property and leave that to the managers of the company that I invest in. Thanks Gareth, your reasons for choosing stocks sound exactly like mine. You only have to go on some of the BTL forums to see the potential risks from bad tenants, and that’s a degree of hassle that I just can’t be bothered with. And of course if we get inflation/high interest rates/credit crunch/a government that embarks on a massive building program/(insert random negative factor for housing market here) then significant price declines and negative equity for thousands of BTLers could change peoples attitudes to property for years, as was the case in the 1990s. I like these lessons, not least because you sound eerily similar to me. I sold my house in 2004 and, ‘due to the property market heading for a crash’ chose to rent for years rather than immediately buy again. Did you ever buy back in? 🙂 I did. I also worked as a ‘software engineer’ (in reality, a COBOL analyst/programmer) for almost 10 years. And I gave up deep-value investing years ago as I just ended up with crap companies going nowhere. And I am now a skint financial blogger living in Kent in my mid-40s. I do recall buying shares during 2002/2003, though! Hi Maynard, I think perhaps we are the same person suffering from some sort of multiple personality disorder. Your description fits me to a tee, except that I was an RPG/400 analyst/programmer in the insurance industry. No, I haven’t bought back in yet, but have instead lived in lots of houses that I could never afford to buy, which has been nice (I am not exactly a poster-child for frugal living and retiring early). I am sure I will buy again at some point, but currently I’m in no rush given the demented property prices in the south east. Having said that I might just buy anyway if I get sick of moving every couple of years (my landlords have a habit of either dying or emigrating to Australia). John, It looks a lot worse than this to me. This is one of the highest in the world apart from Hong Kong and Australia when it reached it’s commodity hyped peak. 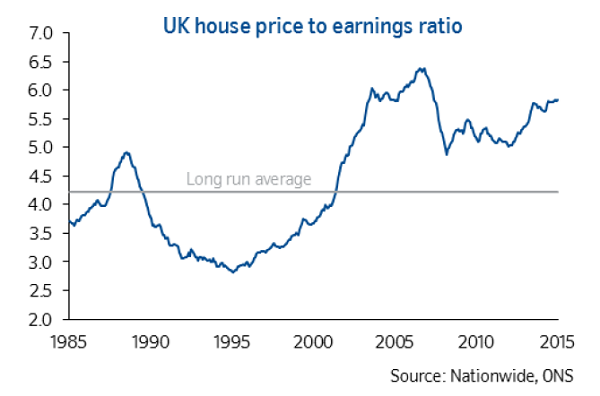 Property prices in the UK look some 85% overvalued. Hi LR, the ratio depends on exactly whose data you use, but yes, I’d generally say the property market looks even worse than I suggested in the post. Try telling that to the average Joe. My family all think I’m nuts for suggesting that the housing market is quite possibly headed for decades of under-performance. Time will tell but for now I still think I’m right (probabilistically speaking; of course I have no idea what actually WILL happen).